Jovana and I hit it off immediately. She was wanting to do a half up half down style or Side-Swept. We ended up doing both at the trial run and she decided she wanted it to be side-swept with a lot of volume and a braid incorporated. Jovana and Tim met in High school and they went on their first date their Junior year. Nothing had come of it, UNTIL - they reunited in their second year of college when Tim transferred to Jovana's College and they had sushi together. They've been together ever since. Isn't that adorable!! Congrats to Jovana and Tim! Thank you for hiring Sweetly Pinned Hair and Makeup for your bridal parties hair. Groom & Groomsmen’s Tuxes | Jos. A. Bank Clothiers, Inc.
Jovana is a sweet as can be, and I was honored she picked me for her bridal hair. It was so much fun and her bridesmaids kept me laughing all day long. It was a hot and humid July day, but by looking at these pictures, you'd have no idea it was 90 degrees out. They all looked amazing and I'm so excited to share! Caitlin and I met a month prior to her December wedding and tried out a few different hairstyles to compliment her dress along with giving her the desired volume she craved. We didn't actually do the style at the trial run that she ended up wearing the day of. She knew what she wanted and was absolutely right! She chose to wear a simple yet gorgeous high bun. It was the perfect style for her big day, and boy, did she rock it! Is there anything better than a high textured bun? I think not. Ha! Caitlin and her bridal party welcomed me as soon as I walked in, and let me use my creative freedom for their styles. One of the bridesmaids asked me for a "modern beehive" I was in heaven. I love when brides let their bridal party pick individual styles they want to wear, after all they do have to wear it all day! Either way its always fun getting to know a new group and form a bond. I am so grateful the Brauns recommended Caitlin to me. I felt like we were a perfect fit and I am so excited Caitlin and Adams new journey together. Congrats to Caitlin and Adam, Thank you for having Sweetly Pinned Hair be a part of your Big day! Oh, my gosh! Where do I even begin. I met Jenny three weeks before her July wedding. I was so happy when we finally got to meet and to go over the hairstyles she was looking for. Jenny had a lot of hair but it was also super fine. To create a softer look, we did a few different styles to meet what she was looking for. I always tell my brides, a trial run is the best way for me to get to know your hair and to get a feel for the texture of it. I am seriously so glad I met Jenny, She is SUPER sweet, (like called me 3 days before my own wedding to tell me, Thank you and Congrats and words of encouragement) I mean could she be any-more adorable? I love knowing that while this is not only a job, its also creating lasting relationships with my brides. (warning this will be repetitive in my Blogs, because its true). I was over the moon, when I got Jenny's pictures back and saw how gorgeous she looked (not hard to do when you're already drop dead gorgeous) but to see how the entire day transpired and all of the happiness. 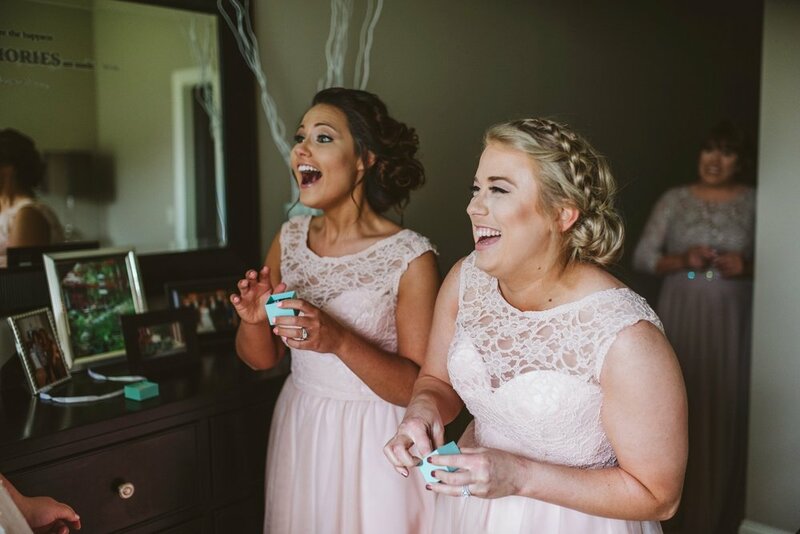 My Favorite Part of The Day -- Mike sent Jenny and her Bridesmaids Starbucks, while they were getting ready and it was the Sweetest. I'll just leave the pictures below and let you decide for yourselves, but all I can say is WOW! Congrats again to Jenny and Mike, thank you for letting Sweetly Pinned Hair, be apart of your special day! When I first met Tara, I realized we were going to be a perfect fit. Not only is she super gorgeous she's super sweet too. During the bridal preview we discussed the options of what she was wanting and how to accomplish it, specific to her hair texture. Tara has beautiful long blonde hair, so I knew the wavy retro look she was going for wouldn't be a problem. The day of the wedding was pure bliss, Elya and I showed up on-site and ready to go at 8:00a.m. and although it was raining, nothing got in the way of great hair and a fun, energetic bridal party. We created each look based off of the styles each bridesmaids handpicked for themselves, and well, the result, was AMAZING. I am so honored to share these experiences with my brides and I loved working with this awesome group of girls.